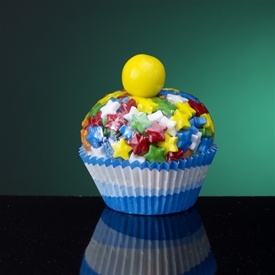 You played...you salivated...you coveted Ooh la la's couture candy cupcakes, but there can only be 2 winners! And here they are in the order they were drawn. A BIG CONGRATS to Tara for winning the "Shooting Star" candy couture cupcake (pictured above) who said that her favorite cupcake flavor is "buttercream & caramel," and another WHOPPING CONGRATS to Cupcake Forum with their classic yet always fashionable answer, "I love chocolate cupcakes, the darker the better!" 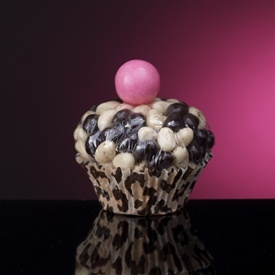 She wins the "Sweet Spots" candy couture cupcake pictured below. "My favorite cupcake flavor is peanut butter and jelly, with S'mores as a runner up!" "Chocolate with chocolate. Boring, but sinful and wonderful." - Emily N.
"Hmmm...lemon cupcakes with raspberry frosting, and raspberries on top. SOOOO good!" Here's my personal favorite: Buttercup's red velvet with cream cheese frosting - classic, delicious and decadent.